Between World War I and II, airplane designers tried tons of experimental ideas, some barely looking like airplanes and few coming out successful. One of the most interesting was the Stipa-Caproni, which looks like a cartoon, but the Stipa-Caproni was actually an important forerunner to modern jets. The body of the airplane was a ducted fan with a small engine inside. The tube body doesn't look complex, but is the result of intense calculations by designer Luigi Stipa. When air entered the front of the tube, the propeller compressed it and shot the air out the back, providing thrust. Surprisingly, the airplane flew really well, with pilots reporting it to be incredibly stable, with no control issues. In fact, it was so stable, pilots sometimes had a hard time getting it to change direction. Ask any pilot, and they will tell you changing direction mid-flight? A tad important. Stipa's design was nothing short of revolutionary, but it never caught on. The biggest issue was payload. There was no room for storing passengers, freight, or weaponry, and as world powers built their forces leading up to World War II, payload was critical for new airplanes. Even though the Stipa-Caproni never caught on, it was still an important link between propeller planes and jet engines. Modern turbofan engines use the same principles that Stipa discovered, so when you fly on a big airliner, you are flying on a direct — and mobile — descendant of this stubby Italian plane. The Caproni CA 183bis had a DB 605 of 1,250 HP in the nose driving two three-blade contra-rotating props with a 700 HP Fiat A.30 radial behind the cockpit driving a Campini compressor expected to furnish a 60 MPH boost of jet thrust for an optimistic maximum speed of 460 MPH with a range of 1242 miles. 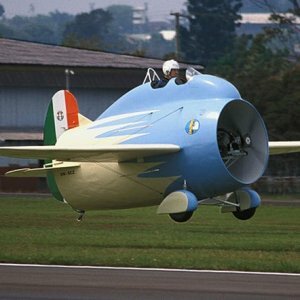 I was aware of the Caproni ducted fan prototype (when I was a kid I just assumed it was a very early jet) but haven't seen that photo before. Neither have I seen those plans for the Ca183 bis. It looks like a modern photo. And the plane has a roll-cage behind the cockpit, not present in the original one. It appears someone had the guts to build a flying replica? Googling it, it is a modern photo. The one in the photo is a 3/5th scale replica built in Australia that flew in 2001 according to the article. Not a type I knew about, nice to see something new. Now there's a sharkmouth for you!